Veteran reporter Tim Krohn did an extensive story on this. MANKATO — Since the late 1980s the Wilmarth plant in Mankato has been burning processed waste from counties in the Twin Cities and the region. Before the plant was approved, local environmentalists fought bitterly against it, arguing the toxins from emissions would endanger people’s health. But over the decades the plant has operated at near capacity, largely without notice and hasn’t had any serious violations of its permit. 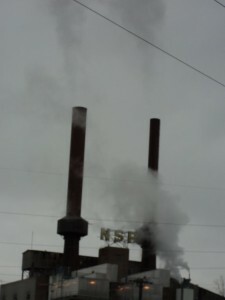 Now, as Rasmsey and Washington counties prepare to increase the amount of garbage that is processed and burned, Xcel Energy says the Wilmarth plant and another they operate in Red Wing play a key role in reducing the amount of waste going into landfills and producing electricity, with the Mankato plant’s two turbines making 20 megawatts of power. But a Red Wing activist who’s long opposed the amount of waste being burned says Xcel shouldn’t be in the business of incineration and that the Minnesota Pollution Control Agency is misguided in pushing for waste incineration and doesn’t put strict enough limits on stack pollution. City of Red Wing, MN, screws up. As a long-time opponent of nuclear power and garbage incineration, and advocate for environmental concerns, it’s ironic to find myself living in a city of 16,000 people containing two nuclear reactors, two garbage incinerator smokestacks, a nuclear waste parking lot, and various garbage and ash dumps both open and closed. Still, there are many nice things about Red Wing including it’s picturesque location on the Mississippi River and a generally friendly, low-crime atmosphere. This, folks, is what is REALLY going on. The good news is that the cost of solar has dropped and it’s really happening. The bad news is that it will happen slowly and expensively if the utilities keep a chokehold on it. Utilities have long since mastered the art of pretending to promote what they are actually blocking. Perhaps no utility in the world is cleverer at this than Xcel Energy (Northern States Power Company). The breadth and depth of NPS’s current efforts to gut the utility regulatory process and impose its will on Minnesota energy policy is breathtaking. Stand by for more details on this. And: expect some really horrible legislation to sneaked through the Minnesota Legislature.